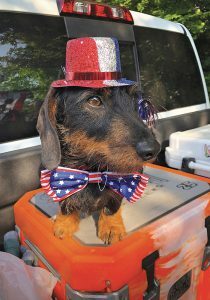 Piedmont Virginian recently had the opportunity to sit down with Winslow, a 2-year-old Wirehaired Dachshund living in Loudoun County. 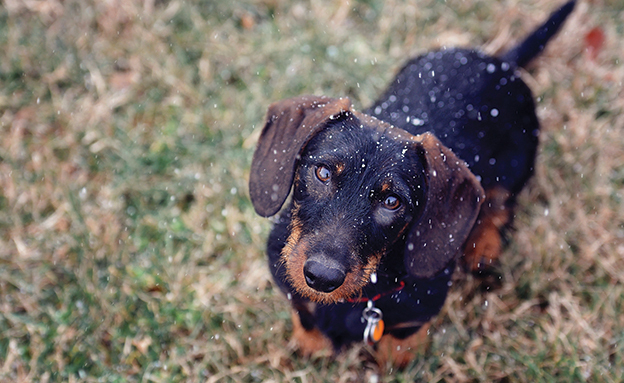 Over biscuits on his front porch, we found out a bit about what makes this Teckel tick. Piedmont Virginian: Thanks for chatting with us. May I call you Winslow? Winslow: Of course. I also answer to Chikinbutt, Squirt, or any number of other nicknames. But mostly it’s Winslow. PV: Winslow is a very distinguished name for a dog that’s rather… well, you know. W: No, I don’t know. W: Oh that. Yes I can see how some might say that. It’s my body, right? PV: Yes. Your legs, in particular. W: Some say they are very, very short. I like to think they’re just long enough to reach the ground. W: What’s wrong with my feet?? PV: Well, your front ones are really big. W: Ah, my diggin’ paddles. Impressive, huh? I think I’m bred to hunt burrowing animals or rescue trapped miners or something. Until I find that special purpose I intend to just keep practicing by ruining the yard. PV: And your back feet are rather… delicate. W: Are they? Never seen ‘em, to be honest. They’re pretty far away. But when I’m running they are sort of just along for the ride. I’m what you’d call front wheel drive. W: I started as a Miniature, but I outgrew that designation. My dad says it’s because so much awesome could not be contained in a miniature body. 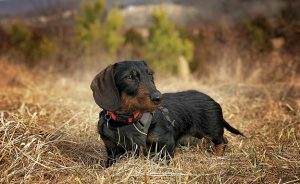 ‘Teckel’ can refer to any Dachshund, but in places like Britain and Hungary, where I’m from, it means a working, Wirehaired Dachshund. PV: Tell me about your hobbies. I understand you enjoy the outdoors? W: I have been hiking a lot with my siblings and that’s super fun. I love tracking too. 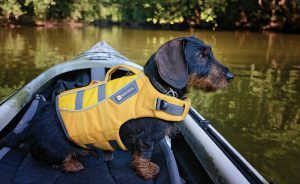 I tried kayaking and I like it, but the water makes me nervous. Not a strong swimmer, despite these canoe paddles at the end of my arms. PV: So the swimming, is it a mental block? W: Oh no, it’s definitely a physical block. I get in the water and spin upside down like a fat guy in a hammock. Try doing the backstroke with two inch legs. PV: You mentioned tracking. What kind of tracking? W: I’ve been training to do blood tracking for wounded deer. It’s something we Teckels are often good at because we have great noses. Being close to the ground helps with the scent, of course, but with that comes often having to navigate through heavy brush and tall grass. So you’ve also got to be tough to push through all that. 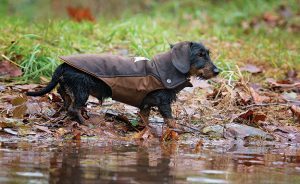 But when I get on a scent trail, there’s no stopping me! I have recovered a few deer for my dad and his friends. They always make me feel like a hero whether I find the deer or not. PV: Can we talk about clothes and costumes? PV: No no no, don’t worry, we will only run photos you have agreed to. No costumes, I promise. It just seems like small dogs tend to get humiliated with embarrassing outfits. W: Well if it’s cold and I’m wearing a coat, that’s one thing. As we touched on before, I am close to the ground and sometimes I welcome an extra layer. But the ‘I’m with Stupid’ t-shirts and stuff I can do without. He got me a sweatshirt once, a hoodie, with pockets on the back so you could see them. Think about that. Pockets. On the back. Two inch legs. Hope there’s nothing important in there. And forget about hats. I do not do hats at all. The only purely decorative clothing I like is my Oktoberfest outfit. PV: You’re an Oktoberfest fan? 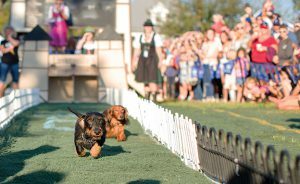 W: Where I live in Lovettsville there is a great festival that features Wiener Dog races. 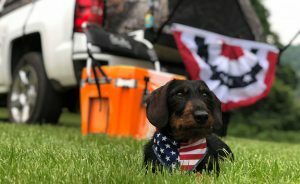 That’s another name for dogs like me, Wiener Dogs. Anyway, it’s a big deal. I had only been in America for a couple months the first time I ran as a 5-month old, I was the youngest racer in the field. But it’s a whole weekend of fun and everyone dresses up in German whatever it is, Leadersomething? W: That’s it. I have a little shirt that looks like that. Everyone loves when I wear it. PV: How did you do in the race? W: I won my first race and lost my second one. The following year I did the same, won one and lost one. It’s a single elimination tournament. PV: So, not exactly dominant in the racing. W: Easy, now. Lots of Hall of Famers with records worse than .500 you know. But, sure, I’ll admit that it took me a while to even figure out I was supposed to race. I like to chase dogs that run away from me, for instance. My dad says that’s a great way to come in second in a two-dog race. PV: But you did eventually figure out the point of it? W: Oh yeah, this last Oktoberfest I had my best races yet. I won my first two races and reached the Final Four, but lost the next one. I did get to race again for a shot at third place but came up a couple inches short (heh) so I ended up fourth out of sixteen racers. I’m happy with that. Mostly I’m happy for my dad. PV: He’s proud of you, win or lose, I’m sure. W: I know. But I think for him, for months leading up to Oktoberfest he’s promoting me, designing logos, printing shirts, stuff like that. Then the day comes, and the whole town is cheering, chanting my name even, and he holds me up like Lion King, I know that’s fun for him. PV: So it’s good to win and keep that moment going for as long as possible. W: Right. It’s the one time when the entire town celebrates me, celebrates every dog there, the same way we are celebrated every day at home. PV: You are the Lion King. W: I am the Lion King. PV: Winslow, it has been a pleasure. Thank you for your time. Would you like a cookie? W: Don’t mind if I do.